We use our Smartphones for a lot of tasks, ranging from mandatory to simply for entertainment purposes. Android offers wide variety of applications to fulfill the needs and requirements of it's users. What the Android user base wanted was a decent Financial Application to keep records for their daily life transaction and to give Statistics for the records. The creators of CoinKeeper have responded to this need with their awesome Financial Application. 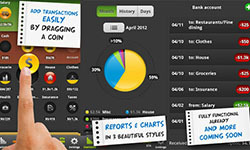 Actually, CoinKeeper was already known to the iPhone users and it was crowned as iOS best Financial Application. The creators decided to enter the Android market and they gifted us this amazing financial app. To be more clear, CoinKeeper is a financial application focusing on personal expenses and budgeting, and it does fulfill the vision through a visual and pleasant user interface. 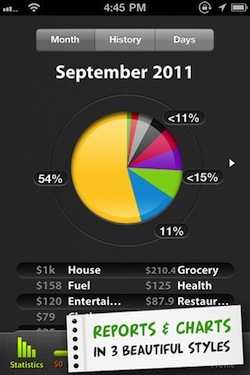 The application has a one-screen overview of the finances. 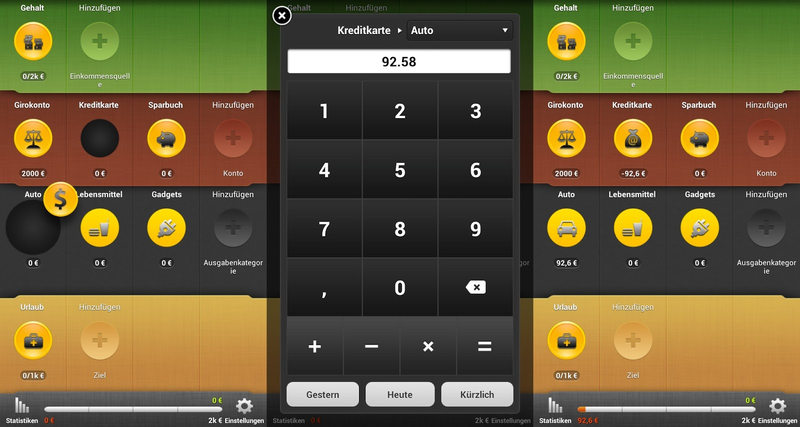 This one-screen overview of finances is divided in 4 panels with the colors of green, red ,black and yellow. The panel in green color is the Income Source Panel, where we should state what is the source of our moneys and how much do we win. For example, you might be employed in a public or private institution and your income is $1400, plus you have another income from the payment made for the shop you put in rent. The panel in red color is the Account Panel, accounts are where we keep or store our wealth/money whether cash or cashless, for example your wallet or your bank account might be an account. The panel in black color is the Expense Categories Panel, this is the module where the application keeps record for our daily life expenses such as groceries, transport, house, taxes, restaurant, food etc etc. The panel in yellow is called the Goals Panel, you might have a goal whether short term or long term for buying some good. With this panel CoinKeeper makes you possible to create a goal (let's say you want to buy a Golf 6 car estimated to be worth $20,000), your goal starts from $0 dollar and increases with every cash you transfer from the Income source panel (green) to your Financial goals panel (yellow) until it mets it's $20,000 goal. So, in a nutshell the user interface as i said is quite practical and joyful for the eyes. The instances of every panel is in a circle form. And you can transfer money from Income source to your Accounts just by dragging the circle forms or "coins" from let's say Income source Salary coin to your Account Panel Bank Account, also you can drag coins from Income source to the Goals panel. Your expense records can be kept only by dragging the coins from Accounts panel ( for example either by cash/Wallet or from a credit card). As i already said CoinKeeper has options for Reports and Charts where it nicely informs about the statistics of our daily transactions. Finally, it's important to mention that CoinKeeper is not a free software. It gives you access over the main features of the application only for 15 days and after that you have the option for purchasing the application. But, this doesn't have any big effect on this awesome-made application. I fully agree with you, CoinKeeper is what Android needed. I have it in my phone and the trial version will soon end. I am planning to fully purchase it because the moneys are worth of it.